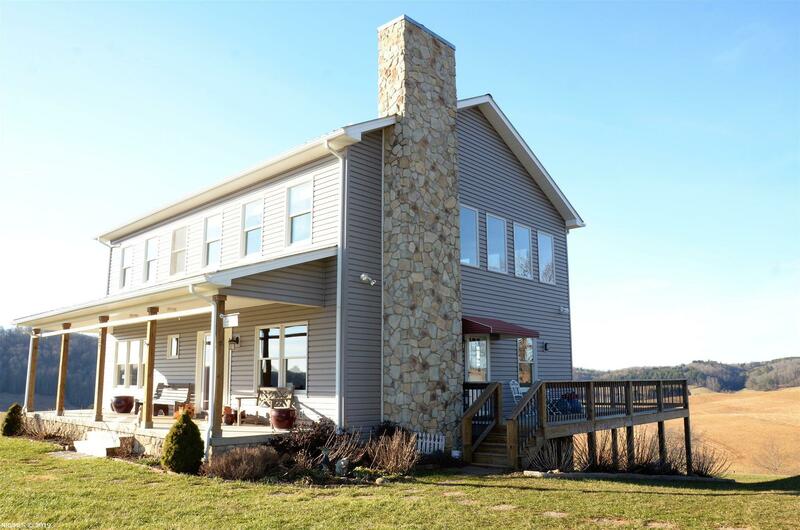 Scenic views and wide open spaces define this beautiful 2-story modern farmhouse one mile from Hwy 221 and about 6 miles from the Town of Floyd. Open concept living space, including first floor master suite, upstairs guest suite, and multipurpose/studio bonus room, make this residence perfect for a growing family or multi-generational family living. Situated on 1.3 acres, the property features 2 outbuildings, a large, seasoned gardening space, mature plantings, and young fruit trees. Home is situated 6 miles from the Blue Ridge Parkway. The basement has 320 sq ft of finished space perfect for kids play area or more living space. Views of the surrounding farmland is breathtaking. You have to see this one to understand the sheer beauty of the views and the flexibility this home offers. Directions: From Stoplight In Floyd, Take 221 North. Approximately 5.4 Miles Take Right On Poor Farm Road And House Is A Mile On The Left. See Sign.